KENNEDY YANKO is an artist whose practice explores the primacy of the senses as a means to gain knowledge and disrupt immediate associations. Yanko grounds herself in a physical practice. She says, “I’ve always understood life through movement and my senses; I have to create something physically in order to truly understand it intellectually.” Kennedy has recently introduced metal, marble, and wood to her practice, providing new framework for her paint skins. She currently resides in and maintains her studio practice in Bushwick, Brooklyn. 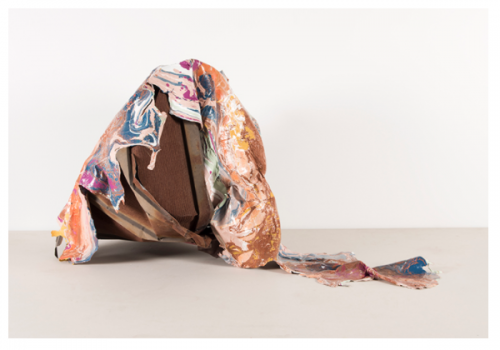 Moving her body to shape paintings on rubber “canvases,” Kennedy Yanko pushes the boundaries of her pieces, or “skins,” to alter the paint’s natural dispersal. This physical interaction with rubber heightened her desire to meaningfully come into contact with other material, and has most recently prompted her investigation into metal-based work. Yanko is a sculptor whose practice is built upon paradox. She understands that one’s perceptions are often in conflict with each other; she uses masculine and feminine systems to create her work investigating the human relationship to industrial materials as objects originally from nature. Working with such heavy, sharp, threatening material requires endurance, care and precision–which differs from the trance-like experience of working with malleable skins. By juxtaposing her paint skin with natural elements like marble, metal and wood, Yanko challenges our associations of the material presented. She points to the integral role of dichotomy in understanding oneself.